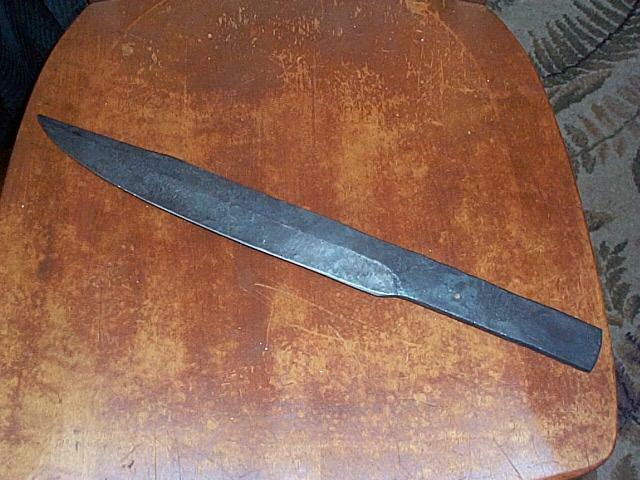 Posted: Sun 12 Aug, 2007 2:29 pm Post subject: Show Us Your homemade blades (and other projects)! I thought I could start a thread called this where we amateurs could show pics of our creations. Easy for folks to find good to share ideas in. 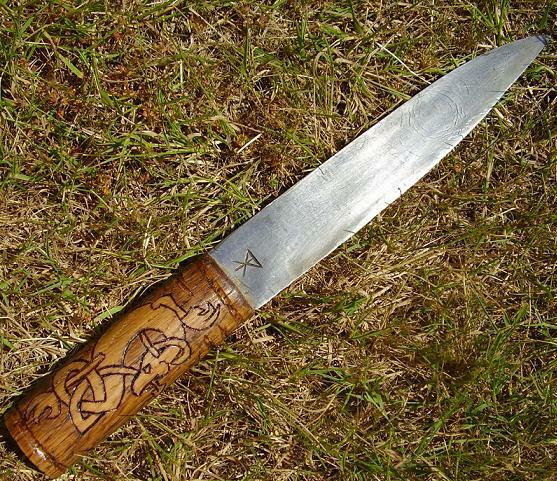 Short utility seax inspired by a find from Jämtland, Sweden ca 850! Battleknife inspired by finds from Danish/German bog ca 500! Here's the knife my brother and I collaberated on. 4140 steel, solid oak grip. A fun project for two complete hacks. very nice work. how can you have access to such a powerful laser? do you work in siderurgy? Here are some rough works. All forged, then the edge was put on with a grinder. Some more. Not very pretty but they are HIGH performance. Forged from 5160, now has a black parachord handle wrap, one of my earlier and best works yet. 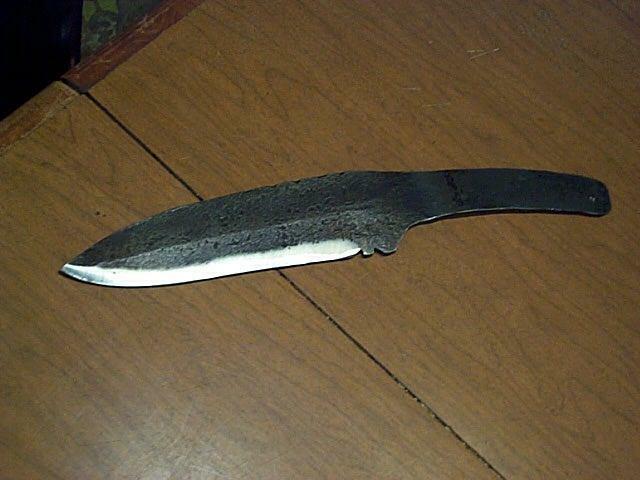 52100 ball bearing steel bowie knife forged by me from 3/4 inch round bar. Great work, i like the feder's a lot. Could you provide some specs on them please? We had tried getting some made up here but i was unable to source any decent carbon steel and the laser cutters that i was dealing with showed very little interest in small jobs. Its a huge pity though as our design was almost identical to yours. Sorry, but the blades went to be hardened and I don't remember exactly. There is a lighter and a heavier version. As far as I remember the heavier is around 1500g mounted. 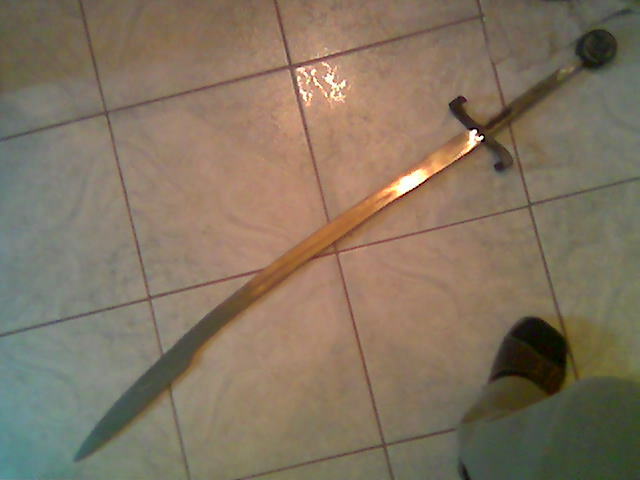 The pommel is around 500g, a bit heavy for the blade, but that's expected from a feder. 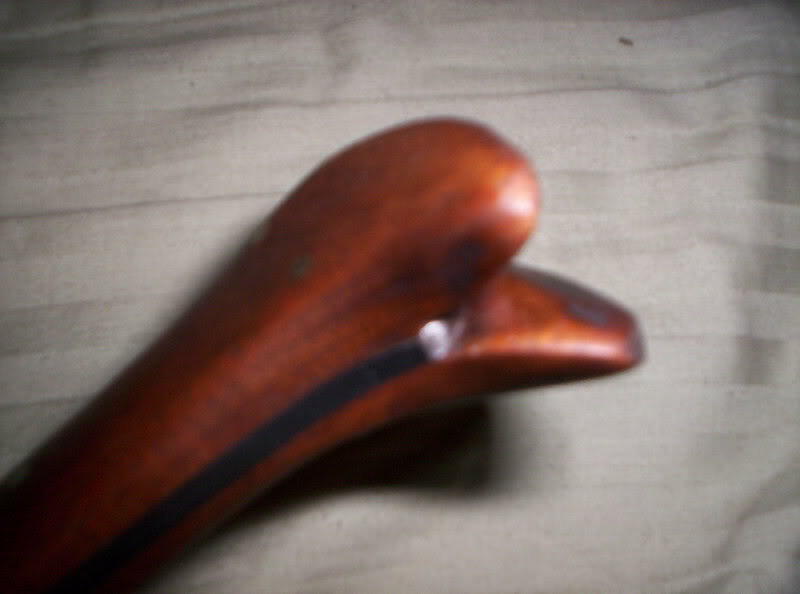 The overall length was originally 1200mm but drawed out a bit by forging and then the tip was bent back to form a ring for safer thrusting. The heavier was cut out of 6mm the lighter from 4mm thick sheet. The lighter one has the same mountings, so the balance is drawn back even further. They are in "experimental stage". If I will have a little time, I will finish and "test" them in September. 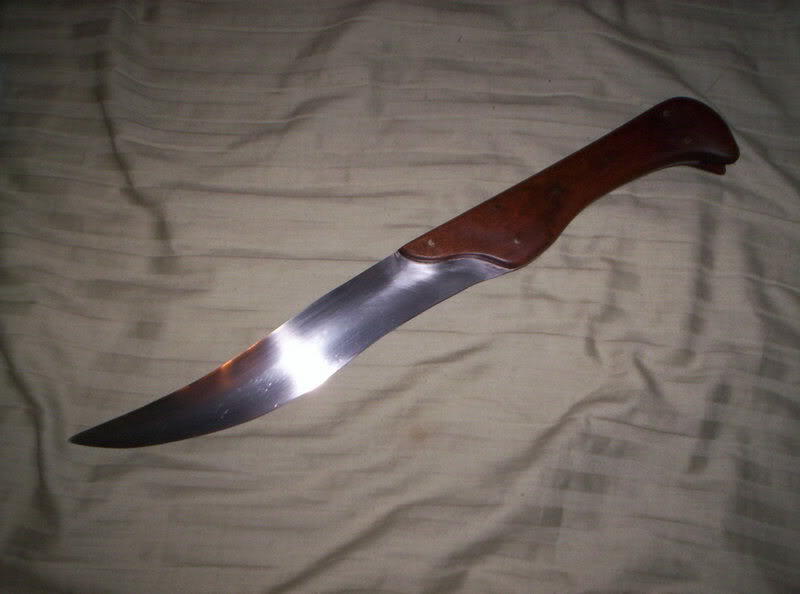 I forged this blade last friday evening when me and my friend had a few beers and did some ironwork. 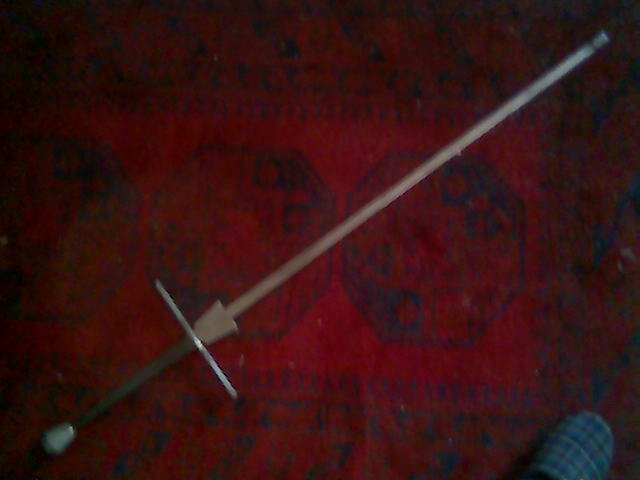 Today I made the handle and I plan on finisching a scabbard for it soon. 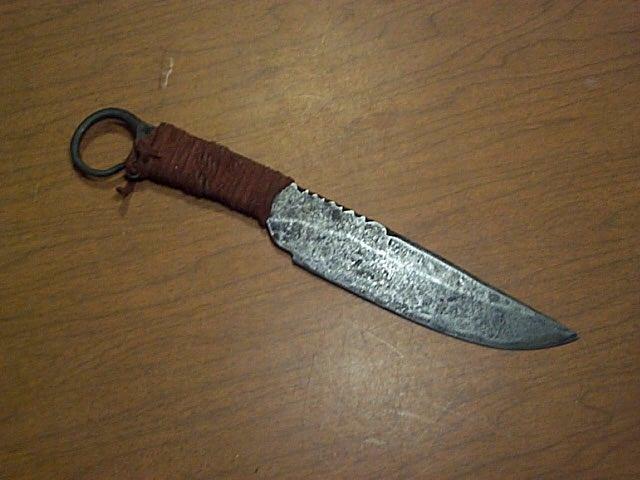 It is a blunt knife for reenactment fighting. I would be interested in learning more about this economical way of working by laser cutting. I will reserve charcoal for me and connoisseurs. I strongly agree with it. 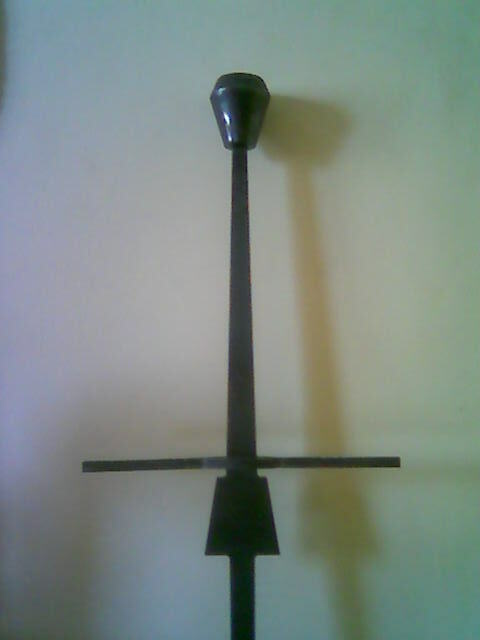 In this case the feder design was chosen because it sacrifices all unneeded features and had the advantages of a practice weapon and the ability to minimise the amount of forging. Just like aluminum wasters. For cutting, the laser was chosen mainly because of its accuracy, availability, some comfort, my shop wasn't functional when this project started and maybe mainly, it really fits the feder design (and maybe the whole idea of it ). The price of it is reasonable, and can be lowered by multi pieces orders. One question on making your own knives, where can I secure brass for furniture? I wanted to fabricate some ferrules for my project, but where to get brass (or bronze) online or otherwise? Is there a place I can buy it in wire and sheet form? I know there are places to buy blade furniture premade, but this is by definition very limiting. 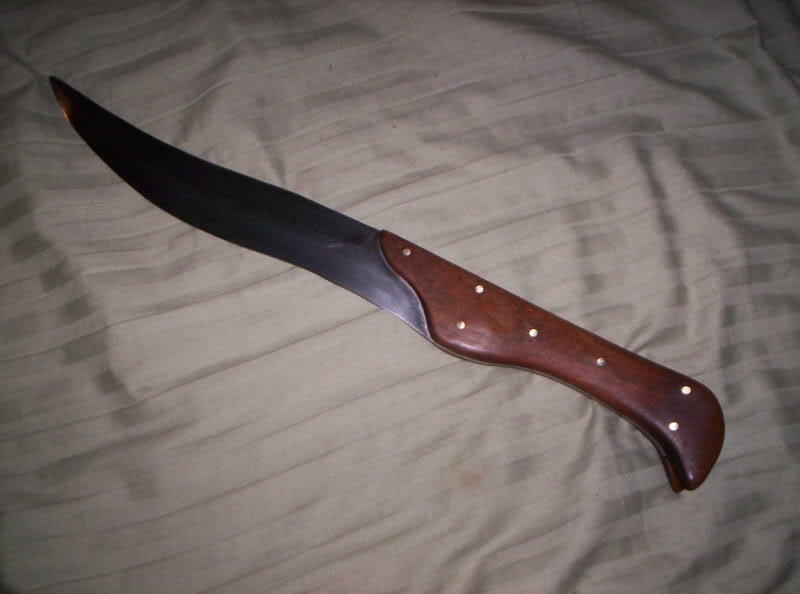 Yataghan-inspired fighting knife. Ground out from 1/8" thick O-1 toolsteel flatstock. Ironwood handle-slabs. 1/8" diamater mosaic pins from Texas Knifemaker Supply. Heat-treated by John Lundemo and Sam Salvati, for which I am very thankful. 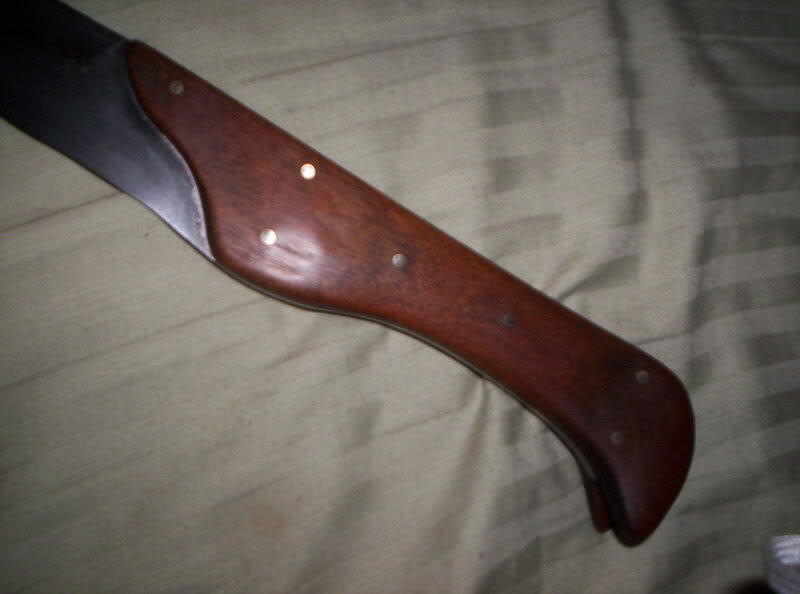 Here is a knife I made a couple years ago. It is the only thing I've done and I think it turned out nice with some really clean lines. I wrapped the handle in 550 cord. Sgian Dubh I made for my son, last time I tried this for myself was about 35 years ago and it got consigned to the bin about 34 11/12 years ago, more patience these days I hope. Materials, mid section from a broken blade reworked, bolster a bit cut from a small steel angle bracket, handle is made from oak salvaged from a Victorian wardrobe. Tools, measure, vice, 5'' angle grinder, punch, various files, sandpaper, glue and some peaceful days in the garage. Hope you like it. P.S. 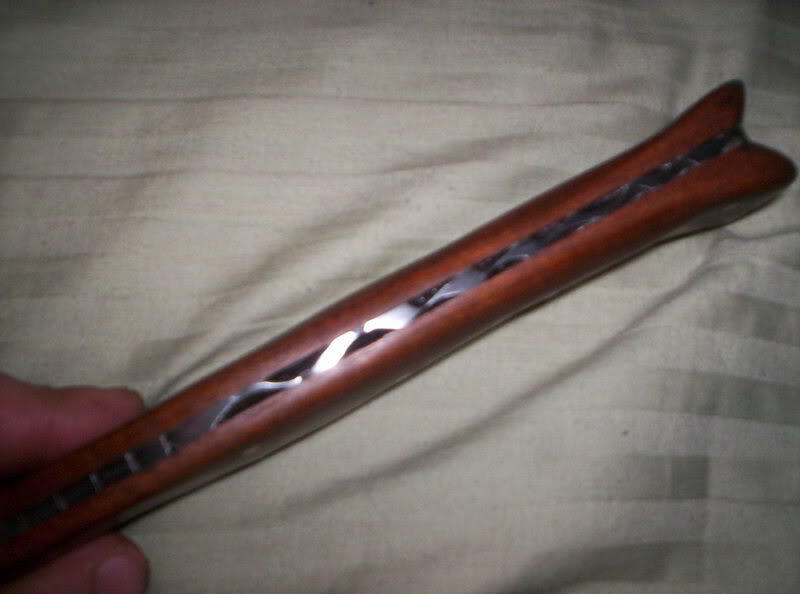 Scabbard at present glued and left happily in a vice until tomorrow. Here's a couple of the blades I've made over the years. 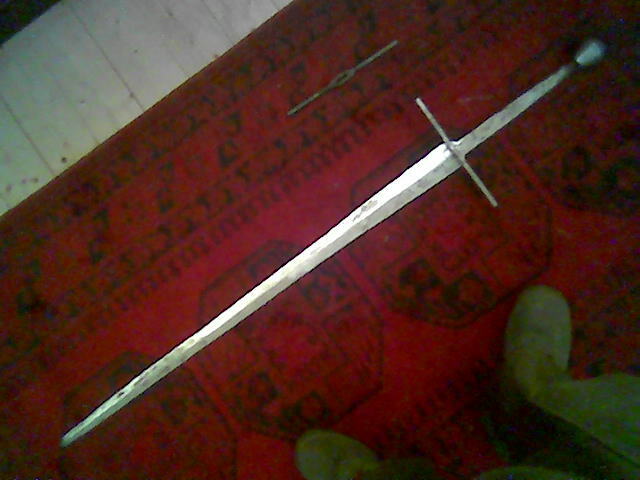 Here is one sword, what I made. Altogether I made 3 swords. This is the second, the third one isn't finished yet, and about the first one I don't have any good picture. When I will have some usable photos of them, I will post them. Posted: Fri 31 Aug, 2007 11:26 am Post subject: Re: Show your homemade blades! 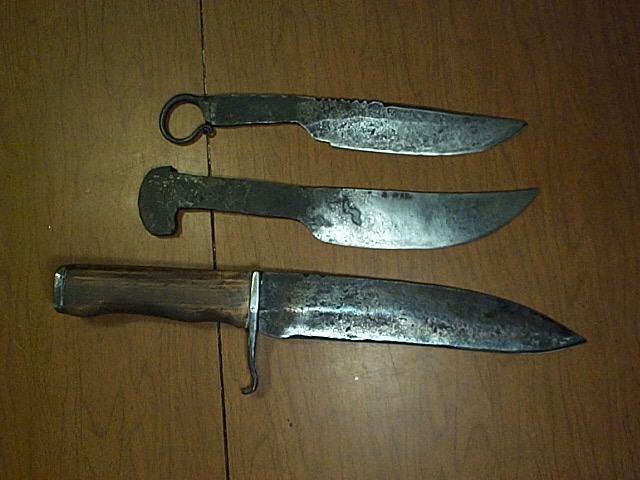 Here´s a groupphoto of my seaxes and knifes. 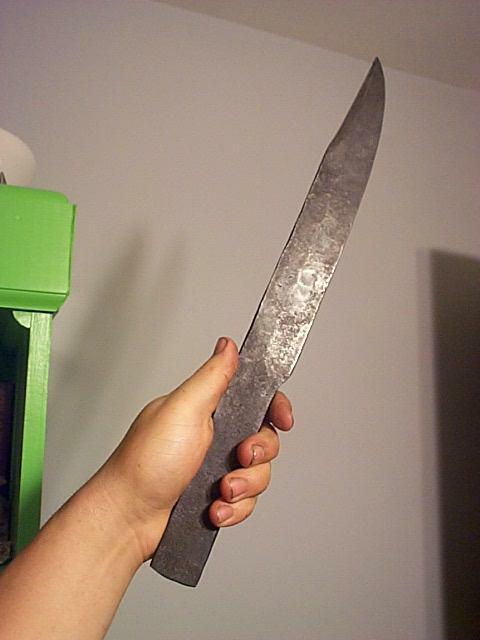 The longest has a blade length of 55 cm. I have made all of them myself exept the little utility knife. All are forged and handgrinded.